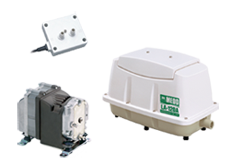 Medo pumps are unique products that feature a patented linear-motor-driven free piston system. Utilised in varied applications, from life support systems to robotics. Nitto Kohki has developed a comprehensive series of precision air compressors and vacuum pumps that incorporate this uniquely functional design. Proven throughout the world for over two decades, we are proud to have been selected by many leading companies in advanced industries as their primary supplier of air compressor type equipment. We produce low- and intermediate-pressure compressors, blowers, diaphragm and vacuum pumps to a unique linear-shuttle design that has only a single moving part, making them far more efficient and reliable than traditional pumps. In addition, we also manufacture brushless and brushed motor-driven diaphragm & cup-seal pumps.